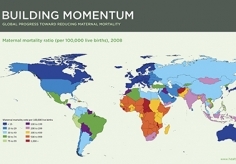 IHME launched its policy report, Building Momentum: Global Progress Toward Reducing Maternal and Child Mortality, at the Women Deliver conference in Washington, DC, on June 7, 2010. 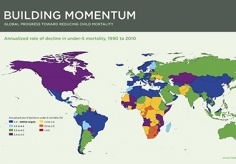 This detailed report includes data on mortality trends for more than 180 countries over two decades. Researchers at IHME, working in collaboration with researchers at the University of Queensland, gathered vital registration data, censuses, surveys, and other sources to create datasets that were more than twice as large as those available for previous studies on maternal and child mortality. Their findings show surprising progress in reducing maternal and child deaths worldwide, especially in countries where declines in mortality have been difficult to achieve. 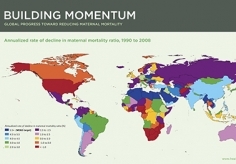 IHME intends to regularly update its estimates of maternal and child mortality to help policymakers decide where to focus health resources, part of the Institute’s ongoing effort to work with governments and non-governmental organizations to gather and analyze data and generate the best possible picture of health outcomes. *Software capable of displaying a PDF is required for viewing or printing this document. You may download a free copy of Adobe Reader from the Adobe website at http://www.adobe.com/products/acrobat/readstep2.html. Institute for Health Metrics and Evaluation. Building Momentum: Global Progress Toward Reducing Maternal and Child Mortality. Seattle, WA: IHME, 2010. In 2008, nearly 80% of all maternal deaths occurred in just 21 countries, and half of all maternal deaths were concentrated in six countries.